Lancet. 2013 Apr 20;381(9875):1371-9. doi: 10.1016/S0140-6736(12)62129-1. 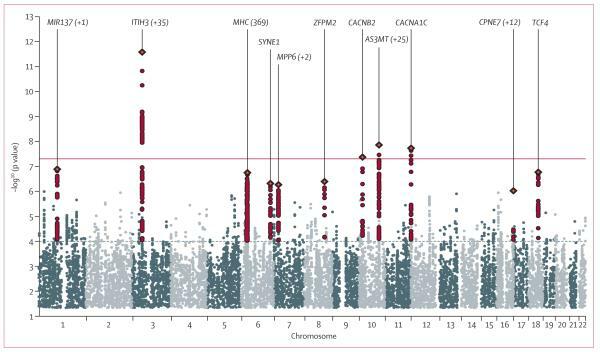 Findings from family and twin studies suggest that genetic contributions to psychiatric disorders do not in all cases map to present diagnostic categories. We aimed to identify specific variants underlying genetic effects shared between the five disorders in the Psychiatric Genomics Consortium: autism spectrum disorder, attention deficit-hyperactivity disorder, bipolar disorder, major depressive disorder, and schizophrenia. SNPs at four loci surpassed the cutoff for genome-wide significance (p<5x~10-8) in the primary analysis: regions on chromosomes 3p21 and 10q24, and SNPs within two L-type voltage-gated calcium channel subunits, CACNA1C and CACNB2. Model selection analysis supported effects of these loci for several disorders. Loci previously associated with bipolar disorder or schizophrenia had variable diagnostic specificity. Polygenic risk scores showed cross-disorder associations, notably between adult-onset disorders. Pathway analysis supported a role for calcium channel signaling genes for all five disorders. Finally, SNPs with evidence of cross-disorder association were enriched for brain eQTL markers.